Hilarion was a priest in the Temple of Truth on Atlantis and He with a group took the Flame of Truth and some documents to Greece. They arrived just shortly before the continent sank, thereby preserving that Flame for the Earth. Hilarion established the Focus of Truth there. Later the Oracles of Delphi were established and the initiates were directed by that Flame of Truth for hun-dreds of years. Great Truth came forth during that time. Then there came into the Temple some lifestreams not so pure and selfless but who yielded to other forces and could be bought. The people had faith in the Delphic Order because of the past and so fell prey to the wrong actions of the priests. It reached a point where the Masters had to withdraw and could no longer use it as a channel for giving forth wisdom. What is known about it in the outer world is from this phase of action of the Order. Hilarion was Saul of Tarsus in Bible time and later known as Saint Paul, the Apostle. He was born of Jewish parents about the beginning of the Christian era, and was well versed in the Scriptures. His set beliefs as to how the Messiah should come caused Him to miss seeing Jesus while on Earth. Soon after Jesus was Ascended He am peared to him while nearing Damascus on a journey undertaken for the purpose of searching out the disciples in that place and bringing them as prisoners to Jerusalem. In that Visitation much of his arrogance and pride were consumed, he was convinced of the sinfulness of the course he was pursuing. His life was completely changed and he became a devout follower of Jesus’ teachings. He was blind after that for about three years due to karma, not only his own but the mass karma of lack of perception, for which he became a focus during that time of the change of cycles—the transference from the Fifth to the Sixth Ray. After a time Hilarion joined the colony of Mother Mary and the disciples. He suffered much remorse for having missed Jesus (while here) and for his actions against some of Jesus’ followers. Hilarion had received a commission from the Master Jesus to preach His teachings among the nations of the Earth. He was in retirement in Arabia for about three years before he started to carry out his new mission. It was due to him for the greater part, that the first distinctive mission to the Gentiles was undertaken. It is said that after his second arrest and trial he was martyred, and that was not later than the year 65 A. D.
It is said Hilarion was Iamblichus, born in Coele-Syria of an illustrious family. He studied in Rome, and later taught in Syria. Proclus mentions his works on Pythagorean philosophy. Hilarion was born at Tabatha, near Gaza, Palestine (about 290-372; date from an encyclopedia). He was edu-cated at Alexandria and is known as the reputed founder of Monasticism in Palestine. He lived as a hermit in the desert and after twenty years he had a great number of disciples and initiators under his spiritual direction. He departed from this earthly plane at a place among some almost inaccessible rocks and evidently ascended into His eternal Freedom. He was well known for his power of healing. He was commemorated by the Roman Church October twenty-first. 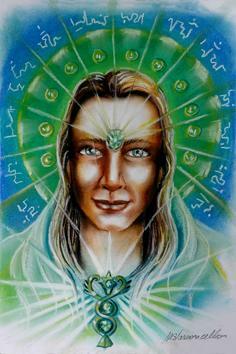 Hilarion is now Chohan of the Fifth Ray, the scientific ray. His hair is golden and His eyes are blue. “Onward Christian Soldiers” can be played to attune to Him. He is particularly interested in assisting the agnostics, skeptics, atheists, spiritually disappointed and disillusioned ones, in inner realms as well as those in embodiment. He has great persuasive power and is very successful in instilling, again, faith in God into them. Hilarion and His Brotherhood also assist lifestreams at the time of passing and will take them to the Temple of Truth; They especially assist the non-believers in the here-after. He will assist anyone to know Truth who desires it. People that believe in vicarious atonement find out when they have passed on, and are on the other side, that it is not as represented. It is such experiences that disillusions people who are sincerely seeking truth. When they are misled and become disappointed, that makes a record in the etheric body, and produces unbelief and skepticism, thus they become agnostics. The Ascended Master Hilarion and the Brotherhood at Crete have offered to assist these people at inner levels. Another of Their services is to consecrate lifestreams of all seven rays who have a vocation. Hilarion especially enjoys working on research in the medical profession. Healing is one of His main activities. Now you have the chance to be initiated into the Hilarion Energies. They will envoke in you the energy vibration of Hilarion. You will receive 2 attunements, a Hilarion Chakra Oil and a manual. The first is the basic ALL Ascended Master Attunement. The second is the specific Hilarion attunement.